Over the last few years designers have been deliberately blurring the lines between indoor and outdoor living. Sometimes that includes indoor spaces that open to the outside and take advantage of great views with floor-to-ceiling windows or sliding doors. In other cases (as in the photo you see here) it can involve outdoor areas that offer the structural permanence of a home but are open to the elements. Solid walls and even a built-in fireplace create a comfortable sitting area that feels both enclosed and open at the same time. What can you actually do out there? Here are some fun ideas for outdoor entertaining. 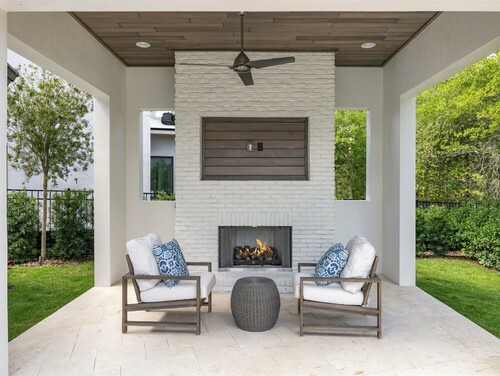 The image at the top of this post shows off a great lanai that we built for a client in the Naples area not long ago (and here’s an article on how to choose the best lanai for your home). But that’s just one way to take advantage of an in-ground pool. Here’s an image of a pool building that provides a sheltered spot to sit and enjoy a drink if you want to get out of the sun. It features a fireplace for cooler evenings or even a gentle rainy night. Another option is to build a structure that has changing rooms in it so that guests don’t have to go into the house to change into swimming suits. Here’s a look at another popular outdoor space. Outdoor kitchens can be a great addition in a place such as Naples where the weather makes it a pleasure to cook and eat outside. 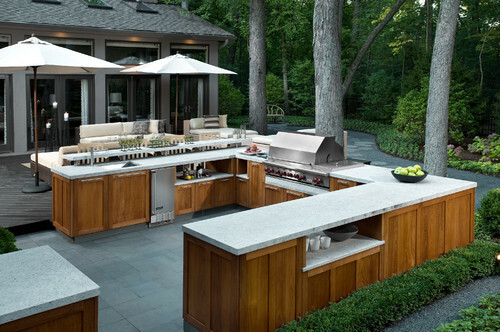 You can make your outdoor kitchen as elegant and sophisticated as you like—with built in grills, countertops, cabinets, refrigerators, and sinks. Or you can keep things simple. It’s up to you. But if you like to entertain outside, it’s nice to move your meal preparation outside as well so that you and your guests don’t have to be separated. If you’re thinking seriously about an outdoor kitchen here’s an article about essentials to consider. 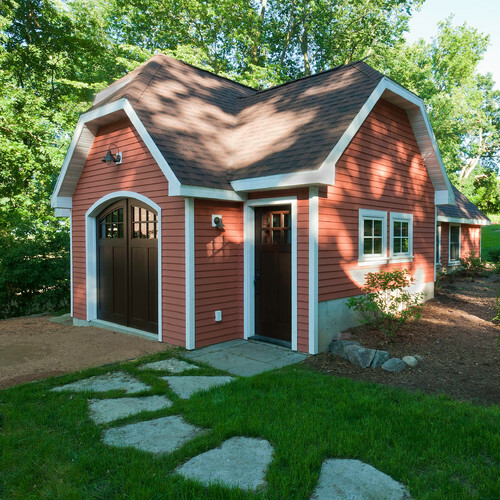 If you have a hobby that requires more space than your home or garage can accommodate, you might want to think about a stand-alone structure that can serve as a craft or hobby space. The building you see pictured here is a great example and could function as a pottery studio, a woodworking shop, or as a home for any number of hobbies. It can be particularly welcome if your hobby is generates more noise (woodworking tools), heat (a kiln for pottery) or odors (think of a painting studio) than you want in your home. These four ideas are just the beginning of your options. You might want to build a patio or a walk-through garden with hardscape features that lend a sense of permanence and structure to your garden. Or you might want to build on a screened-in porch. You’ve got plenty of choices and we’d love to help you fulfill your outdoor living dreams!